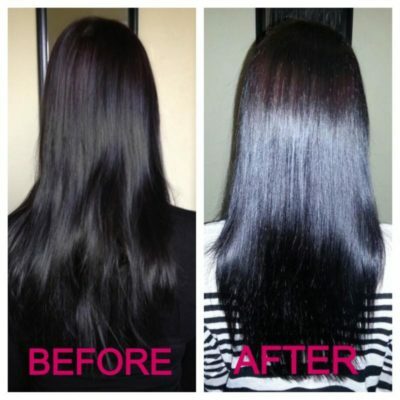 Looking to amp up dry, brittle, and dull locks? 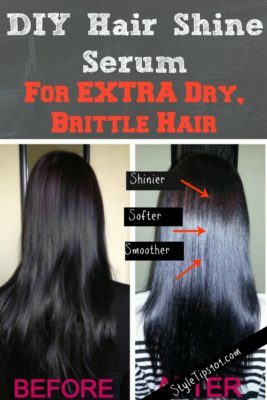 This DIY hair shine serum is specifically formulated for super dry, brittle hair, and adds a ton of shine all while smoothing hair down and preventing frizziness. 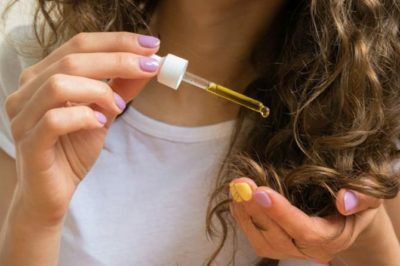 Made with all natural oils and ingredients, this DIY hair shine will become your new favorite serum because it’s just THAT good! Use as a leave-in conditioner on wet hair or apply over dry hair as a shine serum – the possibilities are endless and the choice is all yours! In a medium sized bowl, mix almond oil, avocado oil, and castor oil. Stir well until all oils are well combined. Then,a dd in the lavender essential oil and sandalwood essential oil. Stir well. Pour serum into a clean, dark, airtight bottle. Apply a small amount (depending on the length and thickness of your hair you’ll have to figure out how much or how little you’ll need!) and work through dry or wet hair, focusing on ends. For those with oily hair, do not apply to roots. Castor oil nourishes the hair follicles and encourages healthy hair growth. Avocado oil unclogs hair follicles making it easier for the other oils to penetrate the hair. Sweet almond oil prevents hair loss and also moisturizes dry scalps. Lavender essential oil adds a beautiful, calming scent and also prevents hair loss. Sandalwood essential oil soothes dry, irritated scalp. Keep the serum in a dry, dark place for 6 months. Use as often as needed.